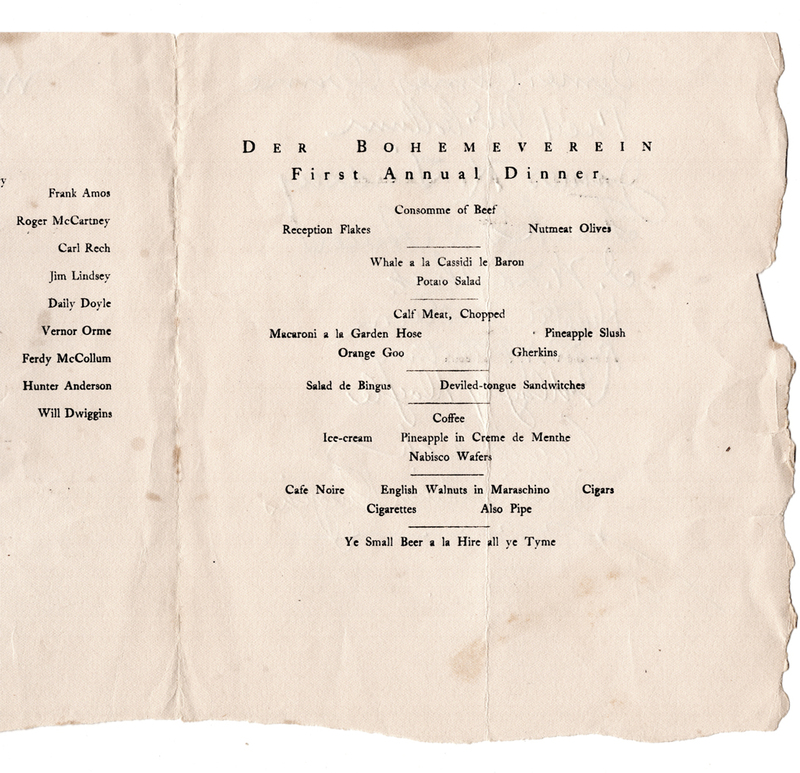 Verso of Der Bohemeverein First Annual Dinner program (1903). Typography by W.A. Dwiggins. Image courtesy of Special Collections, Boston Public Library. Recto of Der Bohemeverein First Annual Dinner program (1903). Typography by W.A. Dwiggins. Image courtesy of Special Collections, Boston Public Library. The participants in the dinner were a motley lot with little in common other than the Cambridge High School. I.W. LaChat had been the music professor at the school since 1897 while the others were all either past or present students. Only Amos, though, was a classmate of Dwiggins’. The others were all younger by two to eight years. Several had ties to The Tatler, the combination literary magazine/muckraking weekly that Dwiggins published from September 11, 1903 to July 2, 1904. Fred McCollum was initially its literary editor, but became its managing editor with the October 23, 1903 issue. At that time Daily Doyle joined as its advertising manager. Dwiggins was the art editor before becoming the editor with the April 9, 1904 issue—at which point McCollum became the associate editor. Rech, Orme, and Anderson were never listed on The Tatler‘s masthead, but they are all mentioned in the convoluted tale of its dissolution in the final issue. McCartney, Doyle and Dwiggins officiated a high school track and field program on May 26, 1904. At a baseball game that day McCartney played catcher. There are no known links between Dwiggins and Lindsey other than the Der Bohemeverein program. The dinner may have been tied to either the high school commencement events at the end of May or to the closing of The Tatler in July. The presence of LaChat is the principal evidence that it may have been connected to commencement as were the track and field program and baseball game mentioned above. Unfortunately, there is no description of Dwiggins’ talk on “Der Bohemeverein” as it would likely have explained the dinner’s raison d’être. As it is the program remains as the only evidence that it took place. Although a minor bit of Dwigginsiana, it provides some hints about his year and a half in Cambridge following his schooling in Chicago. 1. 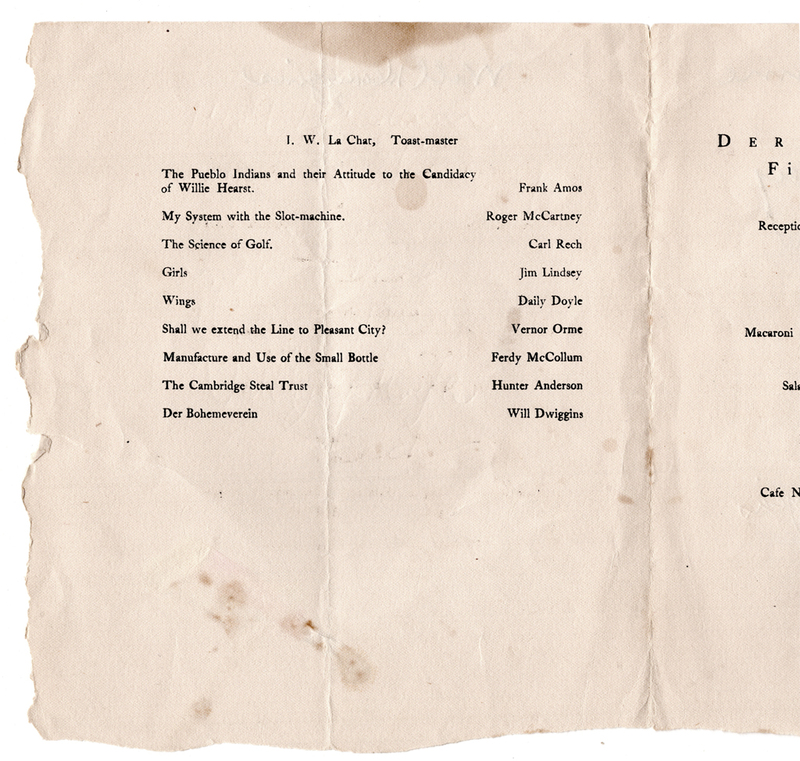 Der Bohemeverein First Annual Dinner program is in the Boston Public Library, 1974 Dwiggins Collection, Box 36, Folder 1. It is a single sheet folded in half, printed in black on the inside in Caslon type with the signatures of the participants on the reverse. For Der Professorverein see The Definitive Dwiggins no. 169. 2. “Bohemeverein” is a concocted word. 3. See The Jeffersonian [Cambridge] 7 April 1904, pp. 4 and 5. 5. The Tatler was originally called The Tattler. It changed its spelling with the December 25, 1903 (vol. 1, no. 15) issue. A nearly complete run of the publication is in the Boston Public Library, 1974 Dwiggins Collection, Box 35, Folders 32–40. R.H. Anderson and Homer Weedon, as receivers for the Tatler Co. vs. James R. Barr for $1.000.000.00 damages. R.H. Anderson and Homer Weedon, as receivers for the Tatler Co [sic] vs. Turner G. Brown for $8.621.50 on note. R.H. Anderson and Homer Weedon, as receivers for the Tatler Co [sic] vs. Carl J. Rech for $72.820.00 on note. Carl Rech affirms that the note held by the Company with himself as vouchsafe is false. J.K. Hall in a poetic trance revealed the fact that Rech has been in conspiracy with the defaulters for months. Sterling Thomas is one of the heaviest loosers [sic]. Having paid for his paper weeks in advance. Carl Rech on being interviewed as to his losses, broke down and cried like a child. R.H. Anderson and Homer Weedon, as receivers for the Tatler Co. vs. D.L. Doyle and Will Dwiggins for [$] 8.065.282.01 with interest. Clifford Carnes, Jay Reasoner, Rowland Taylor attorneys. A list of some of the articles attached by the Sheriff are as follows. In Doyle’s trunk were found, 78 white silk shirts, 14 pairs of pants, 123 neck ties, 12 coats, 46 collars, one evening suit, two silk hats, 5 pairs of bright red socks and a whisky flask. In Dwiggin’s [sic] trunk was found. One pair overalls, one tooth brush, and a white silk necktie with the monogram C.J.R. on it, presumably from Rech confiscated. 7. See The Jeffersonian [Cambridge] 2 June 1904, p. 1. 8. The steel trust in Cambridge was mentioned in The Tattler vol. 1, no. 7 (October 23, 1903), p. 7. The same issue also had an editorial (p. 2) about the street car lines. See The Tatler vol. 2, no. 22 (July 2, 1904), p. 2 for the “Cassidi” reference: “List Of Missing Articles. / Stockdale’s typewriter, Alexander’s pencil, Hawthorne’s hat, Green’s toothpick, two one cent stamps, picture of Childrens Home, Doe Smith’s skate strap, two glasses of water from Clarkes[,] Cassidi’s ten cents, which was thought to be all the cash taken with them. Carl Rech’s pipe, Ben Orme’s walk, Kitty’s pawn tickets, Chub’s winning ways, Taylor’s spaghetti and a marriage license.” The reference to Cassidi is unclear since there was no one with that name (or a similar one) in Cambridge at that time. However, Arthur Cassidy was the city editor of The Times-Recorder newspaper in nearby Zanesville. 9. “Ye Small Beer a la Hire all ye Tyme” is a reference to Cambridge having voted to go dry in 1903. Hire’s Root Beer was recommended as an alternative to beer. The reference to “Bingus” is unclear. 10. I have been unable to determine whether The Pueblo Chieftain supported Hearst’s candidacy or not. Other Colorado newspapers indicated that there was strong sentiment for the newspaper publisher in Colorado and the West. The eventual candidate was Judge Alton Parker of New York. “My System with the Slot-machine” by McCartney refers to coin-operated telephones rather than to gambling machines. See Telephony vol. 5, no. 5 (May 1903), p. 304.